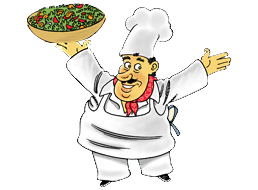 Looking for a lighter aCompanyment or just a light meal? 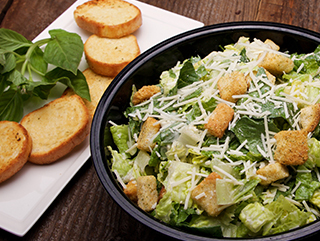 We’ve got a salad to fit your palate. Dress it up with House Creamy Gorgonzola, Sweet Oriental, Chipotle Ranch, Greek Vinaigrette, Balsamic Vinaigrette, Raspberry Vinaigrette, Creamy Caesar, Honey Mustard, or House Made Ranch. 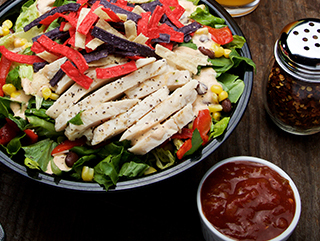 Fresh greens, smoky chicken breast, black beans, roasted red bell peppers, corn & tortilla strips. Add to that our spicy chipotle-ranch & it’s a Tex-Mex kinda meal. 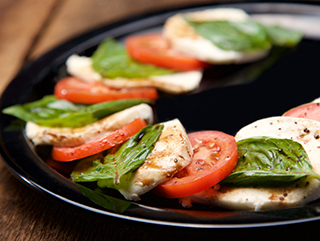 Not a lettuce salad, but the simplest & perhaps the best tasting of Italian salads: fresh mozzarella, sliced tomatoes & fresh basil, with dashes of olive oil, balsamic vinegar & cracked black pepper. 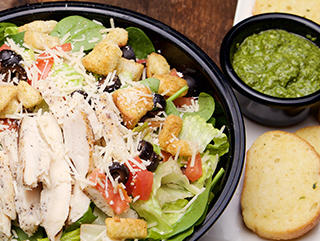 Tender Tuscan-herbed chicken atop fresh greens, black olives, tomatoes, crunchy croutons & rated asiago, romano & parmesan cheeses with our tangy balsamic vinaigrette. 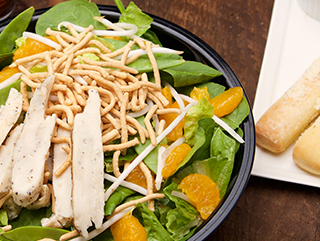 Mixed greens, grilled chicken breast, mandarin oranges, bean sprouts, pea pods & crunchy chow mein noodles with our sweet & tangy oriental-sesame dressing. 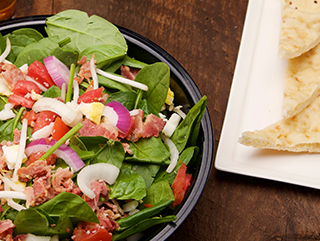 Fresh spinach greens tossed with smoky country bacon, bean sprouts, hard-boiled eggs, red onions & tomatoes, with our raspberry vinaigrette. 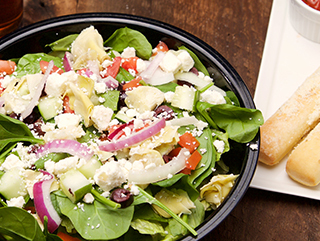 Fresh greens, diced tomatoes, kalamata olives, onions, cucumbers, artichoke hearts, topped with crumbled feta cheese & our Greek-feta vinaigrette. 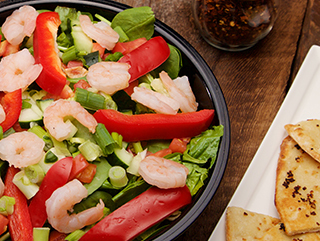 Fresh greens, chilled shrimp, cucumbers, tomatoes, green onions, red bell peppers & our house-made Gorgonzola. 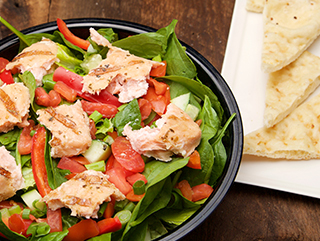 Fresh greens, grilled salmon, cucumbers, tomatoes, green onions, red bell peppers & our house-made Gorgonzola. 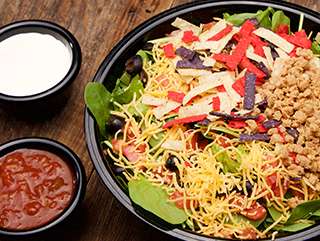 Fresh & crunchy greens, fiesta beef, cheddar queso, ripe tomatoes, black olives & crispy tortilla strips es muy bueño. Top it all off with a side of mild salsa and sour cream. 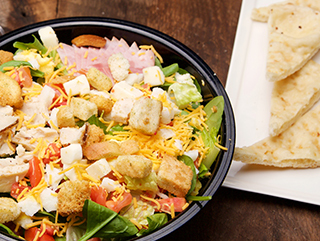 It’s the best chef you’ve ever had… Canadian style ham, roasted chicken breast, hard-boiled eggs, tomatoes, cheddar, mozzarella sticks, with croutons & our house-made Gorgonzola. 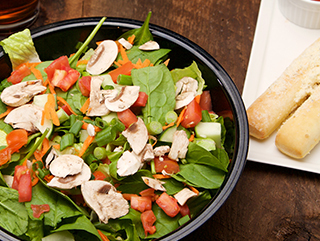 Romaine lettuce, fresh spinach, slivered carrots, cucumbers, green onions, fresh mushrooms, ripe roma tomatoes & our house-made Gorgonzola. 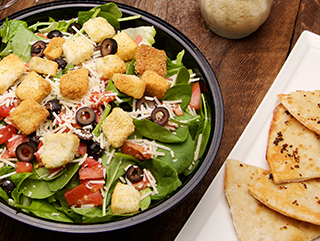 Crispy greens, black olives, tomatoes, crunchy croutons, grated asiago, romano & parmesan cheeses, tossed with our balsamic vinaigrette.